Even experienced gardeners can find it challenging to design a perennial garden where something is in bloom during every season. But our Endless Bloom Perennial Garden makes it easy. We've carefully coordinated the blooming times so you'll have nonstop flowers from spring through fall. Some flowers are even fragrant, and attract butterflies to your garden. 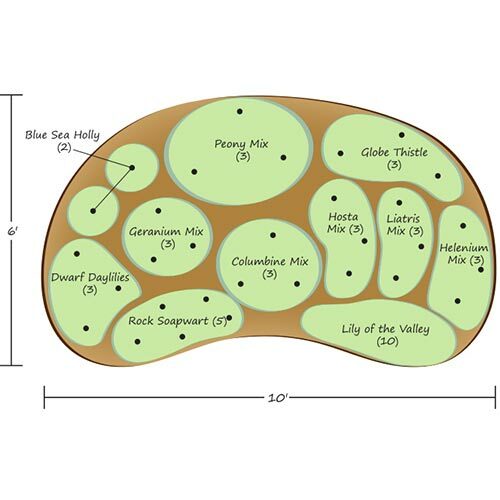 This low-maintenance selection features varieties that prefer sun, and other that trive in partial shade, giving you options for where to plant. The 10' x 6' garden includes 50 plants that take just a few hours to plant and return bigger every year. 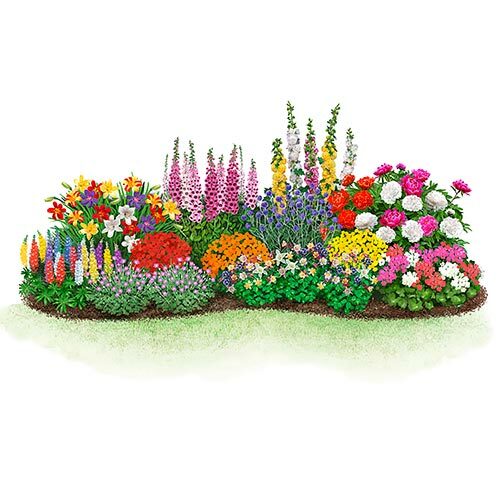 Includes: Mixed Columbine (3 plants), Helenium Mix (3 plants), Peony Mix (3 plants), Geranium Mix (3 plants), 3 Globe Thistle, 3 Dwarf Daylilies, 10 Lily-of-the-Valley, Hosta Mix (3 plants), Liatris Mix (12 plants), 2 Blue Sea Holly, and 5 Rock Soapwart.